Guitarists, Can You Reduce 10% In 2010? You can't have failed to notice the climate change conference taking part in Copenhagen these past two weeks. The objecive of the conference is to agree reductions in greenhouse gas emissions to limit global temperature rise to 2 degrees celcius. 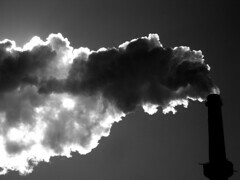 To achieve this experts are calling for a 40% reduction of carbon-dioxide (CO2) emissions by 2020. Now, you might be sceptic on climate change and man's part in it. The question is a complex one and I'm sure we're far from understanding all the answers, but one thing I do feel is that anything we do to reduce pollution of our beautiful world is a good thing. One obvious energy saving comes from choosing to practice and play unplugged more. If you must practice electric guitar why not use a low power or headphone amp, it will consume less electricity than a full tube amp. If you travel to rehearsals, music lessons or concerts then maybe you can reduce the impact of your journeys by choosing to take public transport or walk instead. Not possible? Maybe it's time to look for a more convenient rehearsal space. Making and transporting new gear creates emissions and adds to pressure on natural resources such as woods, metal and materials used in electronic components. Why not choose to spend a little more to get better gear, use less of it and keep it for longer? Extend string life with a good string cleaner. If every guitarist kept each set of strings a few days or weeks longer it would add up to a large reduction in the use of raw materials, manufacturing, packaging and transport. When you do buy equipment it can pay to look around for used items. Not only does this save energy, emissions and raw materials it will also cost you less too. Most players don't use all their guitar equipment all of the time, so why not share it. Club together with musicians in your area to purchase infrequently needed items together and share them. Guitar accessories from metronomes to tuners and from pre-amps to iPods require batteries. Rechargeable batteries are less costly and avoid lots of toxic battery waste. When you have stuff to throw away - worn strings, picks, packaging, old equipment - be sure to dispose of it properly to avoid toxic waste leaking into the nature. Learn about recycling schemes and facilities in your local community and use them. Got old equipment lying around unused? Put it to good use and give others a chance to reuse by offering it for sale or give it away. There are many sites where you can sell or give away your old equipment. All these ideas can not only help to reduce your emission of climate change gases, but also reduce the demand on under pressure and often endangered natural resources. Better still they could also help you to save some money and maybe even create a friendly community spirit among your local musicians. And you, what do you plan to do to reduce your guitar carbon-dioxide emissions in 2010? I'd love to hear new ideas so please leave a comment by clicking the link below.